Don’t go over it, don’t go around it, go through it. If you’re serious about four wheel driving you won’t get far without a snorkel. Fitting a snorkel means air supply is drawn from roof level providing cooler and cleaner air to the engine, which means greater fuel efficiency and less clogging of air filters. Providing hassle-free air induction when immersed in dust and getting you through essential deep water crossings. 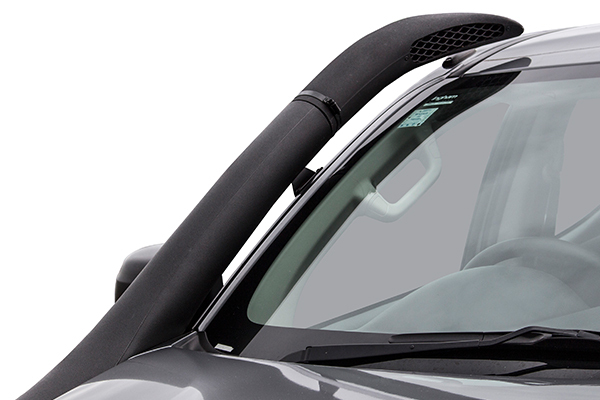 Built from colourfast, UV-resistant polyethylene and uniquely styled to match each vehicle. • Designed to uniquely compliment each vehicle. • Built from UV-resistant polyethylene. • Engineered to supply the correct volume of air or better to the engine. • Intake design separates rain or moisture from the air stream before it enters the engine.